Kidde R-Series Annunciators are high-performance remote annunciators that provide status indication and common controls for compatible fire alarm control panels. This family of annunciators offers LCD or LED annunciation. Models are available with and without common controls. There are three R-Series annunciator models, plus an LED-based expander. Up to two expanders can be connected to any annunciator. The expander includes 24 pairs of LEDs that extend the capabilities of any of the annunciators. All annunciator models include status LEDs and an internal buzzer. Two models have an LCD text display, and one has 16 pairs of LEDs for zone annunciation. LCD models feature a large back-lit, four by twenty character per line, super-twist liquid crystal display. R-Series annunciators and expanders are mounted on a standard 4-inch square electrical box, using the included mounting ring. They can also be surface mounted in locking steel enclosures. Three different enclosures are available. 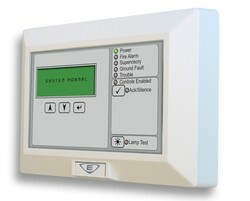 A keyswitch and graphic annunciator interface is available for R-Series annunciator applications. The keyswitch enables or disables common controls. The graphic annunicator interface cards supports 32 LEDs and 16 switches on the graphic panel display. The GCI Graphic Annunicator is an interface card that connects the fire alarm control panel to the display panel of an LED-based graphic annunciator. The annunciator card supports 32 LEDs and 16 switches on the graphic panel display. It includes status LEDs and an internal buzzer. The graphic interface is supplied with snap track mounting. It is attached to a plastic mounting rail that requires two EIA panels. The annunciator communicates with the FACP on the RS‑485 data riser. This can be configured for Class A or Class B communication. The annunciator does not provide ground fault isolation. It is a stand-alone unit that can be powered by the FACP or by an approved power supply. LCD text annunciator without common controls. English. LCD text annunciator without common controls. English. Red. LCD text annunciator with common controls. English. LCD text annunciator with common controls. English. Red. 16-pair LED zone annunciator with common controls. English. 16-pair LED zone annunciator with common controls. English. Red. 24-pair LED zone expander with expander cable and zone card insert. Red.